Recipe by Serena Ball of Teaspoon Of Spice. Place 10-inch cast iron skillet (or oven-safe pan) in the oven and heat oven to 450°F. In a medium bowl, combine flour, salt, ginger. In a small bowl, whisk together milk, molasses, eggs until well combined, at least 30 seconds to incorporate air into eggs. Add egg mixture to flour mixture and whisk until combined – a few flecks of flour will remain unincorporated in pancake batter. Carefully remove hot skillet from oven and add butter; swirl pan to coat bottom with butter. Pour in pancake batter. 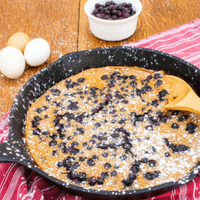 Sprinkle frozen Wild Blueberries over batter. Bake 15 minutes or until puffed and top is set. Serve sprinkled with powdered sugar if desired. Notes If you don’t have a cast iron skillet, use a glass pie plate or baking dish; but do not heat in the oven. Instead spray dish with cooking spray and bake pancake an extra 5-10 minutes.